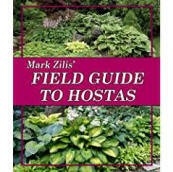 In his Field Guide to Hostas Mark Zilis takes the mystery out of selecting, growing, breeding, and propagating hostas. Through photos, measurements, and comments he describes the 272 most important hostas in existence. This guide does not stop at describing varieties. It delves into topics of interest to hosta growers such as nomenclature, taxonomy, history, and hostas in the wild. All these features along with a thorough discussion of problems faced by hosta growers and the value of various trees, shrubs and companion plants make this a book that every serious shade gardener, hosta aficionado, and horticulturist should own.